Custom design or a readymade theme for your Magento store? Decided to set up your own web store? Congrats, you are on the right way to increasing your sales numbers. However, that would be a lie claiming that ecommerce site development will turn you into a millionaire: there is a huge number of factors affecting your business success. In this article we’ll cover one of those factors — ecommerce web design for Magento platform, in particular. On the one hand, creating a good-looking site that will encourage your customers to buy is pretty tough, especially if your money is tight. But there is a way out even for small budgets — so called readymade themes. On the other hand, having a unique and business-specific design increases your chances to engage prospectives and have better revenues. You know your business better so it’s up to you to decide whether to have a custom design or use a readymade theme. However, we can help you somehow by specifying some advantages and disadvantage of each option. Getting a readymade design is a great solution for those who make their first steps in ecommerce. If you browsed various online resources about design, you certainly came across tons of different website templates available for downloading and further customization. However, this option has its pros and cons. Let’s start with the pleasant side. Affordable. Working off readymade themes is much easier, quicker and, what is of no small importance, it costs up to $200. Support. As these themes are designed by developers from all over the world, it’s more likely that you will be able to get support of those developers while solving problems you may encounter. Ability to see what you get: the theme is already designed and coded, so you know how it will look like installed on your server. It requires less time. Basically, you don’t need to be a developer to apply the theme to your site. However, if you feel you can’t handle this task by yourself, you can always turn on experts who can do it within a couple of hours for you (when we speak only about theme installation). Built-in features. Most ready-made themes are initially provided with many functionalities like blog, product of the day, mega-menu, daily deals etc. built into them, so there is no need to create them separately. Lack of originality. Using the theme not designed in accordance with your requirements (and not specially for you) is far cheaper, but consequently it’s not original one. The same theme can be bought by different users and your website becomes just “one of…”, but not “the only”. Brand representation. One of the most disappointing things about readymade themes is that they’re designed keeping the general functionalities in mind, and it’s really hard to customize them to represent your brand uniqueness. Therefore having the theme, which could possibly be used by your competitors won’t work for a long time. Customization limitations. If you opt using a readymade theme, you have to admit the lack of customization possibilities without additional development. In most cases, you will be able to change some elements, but there is not so much room to play. So if you intend to give your site unique look and feel, you’ll need some help of a Magento designer. Poor coding. The theme can contain bugs that will require additional investment into fixing them. 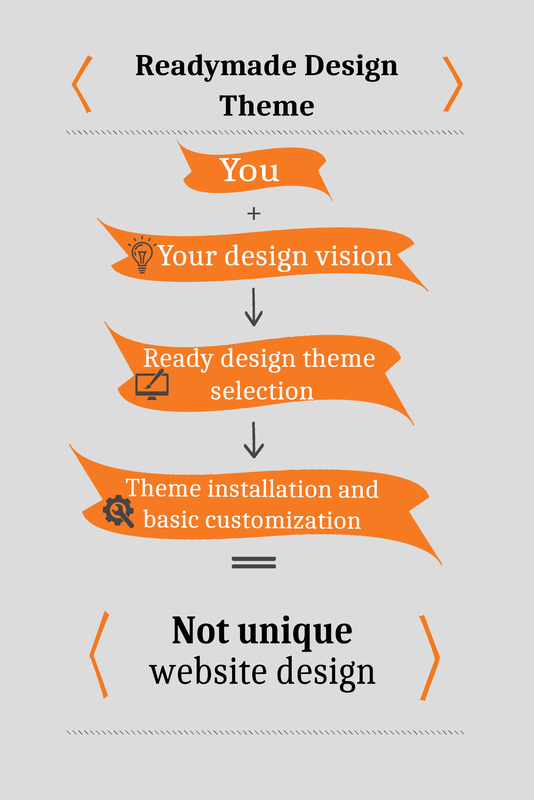 Is a readymade theme the right option for you? Then have a look at our article “Magento fashion themes overview”. In the very beginning of it, we gave some tips on how to select a template and not to get into trouble with it. If you want to come up with your own design — you get a complete freedom in ideas, only your fantasy and sometimes your budget can limit you. Of course this option has its advantages and disadvantages as well. Unique website design. There’s a direct relation between your business success and the originality of your website. If you’re able to create something memorable and something which gives pleasant user experience, you are certainly going to reach the top. Full control over site’s look and functionality. Being a creator of your design, you’re able to make changes, control the visual feel of your website, maintain functionality you really consider to be necessary. SEO-friendly code. Your website will be done with SEO in mind which ensures better rankings and even getting ahead among your competitors. Better rankings result in a bigger number of visitors and ROI growth. Longer development time. As you make your website from scratch, it takes up much more time as you need to create a design first and then implement it. Higher costs. 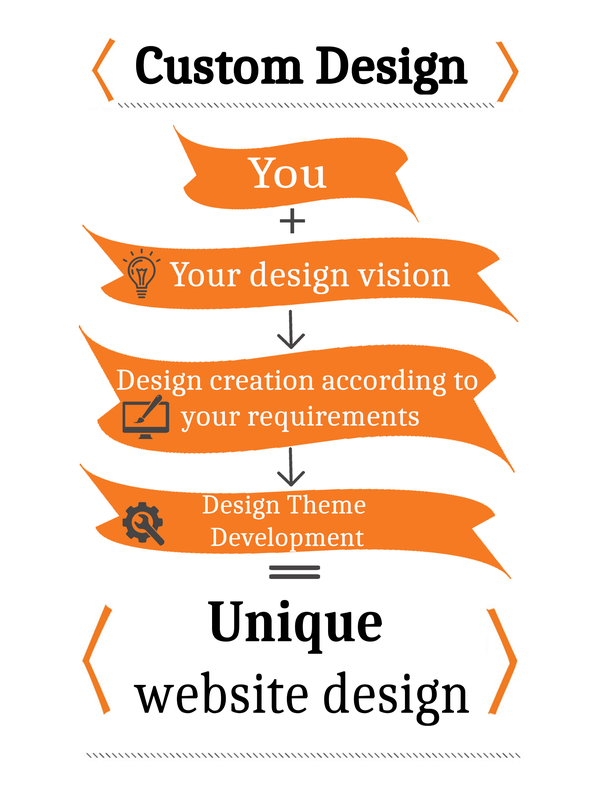 Making a website using a custom design requires developing it in accordance with the business demands. So, it’s going to require extra costs for hiring a developer (unless you are a professional developer) and further website maintanance. Unpredictable result. You never know what your website is going to look like, until the designing process is finished. There is also an option inbetween: you can buy a readymade design template and hire someone to customize it, so your site design and functionality will be adjusted to the needs of you and your customers as well as reflect brand identity. This will save you some money on design and development (compared to developing completely new design template), but it also has hidden dangers as well. No one can garantee you that the theme you’ll select is properly coded. Sometimes bug fixing requires such a great amount of time, that it would be more efficient to create design from scratch. As you can see, your decision about a custom design or a readymade theme depends on many factors, especially budget and timeframe. You can always start small and follow an MVP path using a readymade theme just to see how it goes and make any changes at a later stage. If you are OK to wait for results longer and invest time and money then go for a custom design. Good luck and always remember we’re there to help you out!